As your SME begins to grow, you may find yourself spending too much time in the business and not enough time on the business. So how can you change that? Posted on 2nd March 2018 at 5:17 pm. It is a familiar story. Before you start up your company, you spend time planning and mapping out how you would like the business to progress, what systems you are going to put in place, how you will cope with increased orders. As the business grows, you find yourself becoming increasingly busy and perhaps you employ a couple of people to help out. 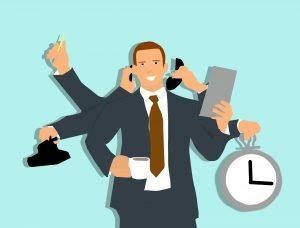 Now you have a small team you think you will have more time to expand your business plan to suit your growing business… but the reality is often different as you get stuck in a cycle of completing tasks yourself rather than delegating, and there just being too much work for you and your team to manage without doing long hours. And because you are so busy, you never get a chance to step back and look at the bigger picture. You are immersed in your business instead of working on growing the business. This is the point where growth may stutter or even stop. There just feels like there is so much work to be done and you don’t feel that you can stop doing any of it in case you lose the business that is coming in. Perhaps the business is at that point where you feel you need more people but the turnover isn’t quite there for you to confidently employ another head. The problem is that you are spending so much time working in the business that you feel you never get the chance to review properly where you are at and what can be done to sustain the growth you are experiencing. Would another head solve the problem? Or merely buy a little time until you find yourself in the same situation again? What happens if you take on more staff only to find the growth slows and you can longer pay the wages? How many companies do you know of that have done that and gone under! Adopting tech in obvious and not so obvious areas, making small changes, can lead to big cost savings and massively improved efficiency. The financial investment needed to make these changes need not be huge – in fact it may be zero – and nor does it need to be a recurring cost. Let’s take the example of a company with a website that they have attached a shop to. A customer browsing the internet one evening places an order via the website. Admin staff arrive at work the next day, see the order and then manually enter the details onto the internal system, making a call to the warehouse/production to check stock once they have inputted the order. The order details are printed off and handed to accounts for them to ideal with and a copy is also given to dispatch so they can label up the parcel. But the warehouse then come back saying they haven’t got the item in stock. Someone forgot to mark the sheet when they shipped the last one out the week before and replacements hadn’t been re-ordered or made. It’s now lunchtime and the Admin dealing with the order has spent most of the morning trying to get this order (and several others) shipped. Admin now has tocontact the customer to provide up dated shipping information or a refund. They need to find the original order and contact details, type up an email……. In the meantime, the other orders are piling up. Imagine now that a small one-off investment has been made. No need to buy new software or systems. The website shop has been integrated with the internal CRM system, the accounts system and the warehouse stock system. The same customer places their order and when Admin arrives the next morning, the warehouse is already picking the item, dispatch address and postage labels are already printed and waiting. The accounts system has been updated without anyone touching a keyboard. And the order can be filled because the stock control is automated – so the stock was re-ordered when it should have been. And if there had been a flurry of purchases for that item and it was out of stock, the customer would have received an automated email with a revised delivery date. And Admin hasn’t even taken their coat off yet. Are you getting the most out of your existing technology? Do you know what your existing technology is capable of and what you can do to make it really work for you? Roar IT Ltd are a professional team of software developers located in the heart of the North West and specialising in systems integration. We can carry out a free systems survey for you, providing tips and advice on how you can get more out of your existing technology. There’s no obligation – some of what we suggest may not even cost you a penny to implement – and the report we provide can be used to gain quotes from ourselves and other developers should you decide to take things further. Phone Judy on 07472 972439 for more information or to book your visit now. “Our software isn’t working, please fix”.